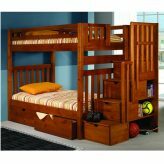 Wooden bunk beds with stairs provide a safe and easy climb to that top bunk. 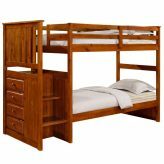 Have you been hesitant to get a bunk bed because of the safety issues? Steps are a bit safer than a ladder although our ladders are extra wide with grooves for added safety. 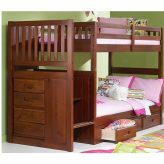 These step bunks also have a banister to grab and built in storage under the steps making it a practical bed. Under bed storage can be added for even more room space optimization. 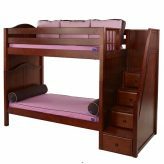 A staircase bunk bed will take up more of your room space but the built in storage under each step may elimiate the need for an additional dresser or chest of drawers. 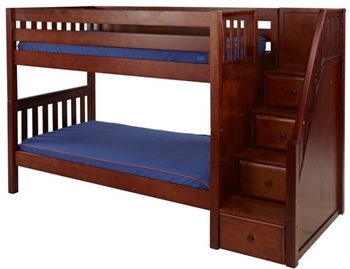 These step bunks come in varying heights and finishes. Mattress covers, curtains, bolsters, and back pillows are all available to spruce up and show off your stairway bed.